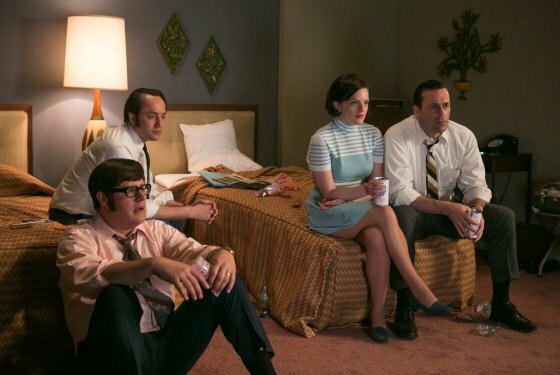 The first half of the final season of Mad Men was often disappointing, but this turned around in Waterloo, which was actually a victory to hold us over until the final episodes are shown next year. The manner in which Mad Men has divided up the final season has led to comparisons to Breaking Bad, another AMC show to recently conclude. Prior to Waterloo, the comparison was often negative, with many fans feeling that while Breaking Bad had one of the strongest endings for a television series ever televised, Mad Men was having a disappointing season so far this year. Both had one thing in common–the protagonist was on a downhill trajectory. However while the path towards destruction was what we anticipated for Walter White, we root for Don Draper to succeed despite his flaws. We want to see Don Draper as the great ad man and Creative Director at Sterling Cooper (regardless of which other names are attached to the firm at various times), and it was disappointing to see him out of work much of the season. Even when Don returned it was with stipulations which he should have never accepted and in a minor role he did not deserve. We have also seen the negative sides of many other characters, including Roger getting high on LSD, Bert as a racist, and Peggy as rather unlikeable, and Joan almost appearing evil in her treatment of Don. This is not what fans wanted to see. Waterloo quickly turned things around. Don was making a comeback with the Burger King account but there were plots to remove him in the background. The episode went from Don receiving a letter indicating he was being fired to a victory for Don when he quickly got the partners together, with only Joan supporting Jim Cutler. Then Bert died, leaving Don again in danger until the episode’s conclusion. The episode also did a brilliant job of capturing the spirit of the era. How many shows could maintain the attention of viewers with multiple scenes of everyone watching television? The moon landing dominated the episode as it did America in 1969, providing a fitting historical backdrop for the concluding portions of the series to match the Cuban Missile Crisis and later the Kennedy assassination at the beginning. In the past there has been a mixed reaction to technology on Mad Men with computers seen as both a modern wonder and as possibly a threat. There was no ambiguity with the moon landing. Bert summed it up with his final words before death with “Bravo,” showing appreciation for both the act and Neil Armstrong’s pitch. When Sally repeated the negative response of the kid she had a crush on to Don, her father quickly dismissed this. By the end, Waterloo brought out the best in many of the characters. When Don feared he was out after Bert’s death, he could have used the Burger King account in his pocket to help secure a new job. Instead he turned the presentation over to Peggy, in an altruistic act to provide for her security in the firm if he was gone. This could have been an excellent conclusion of her arc, showing her old mentor what she could accomplish with Don accepting her as an equal. The episode also showed growth for Peggy in her personal life in the scenes with Julio. Don also showed how he had grown from the womanizer of earlier seasons, turning down the advances of his secretary (who old Don would have slept with) and offering to care for Megan even after she made it clear that their marriage was over. Earlier in the season he had turned down a proposition from the woman sitting next to him on the airplane after visiting Megan, and he sure seemed uncomfortable in that three way. Bert’s value to the firm was often questionable when viewing previous episodes, but he displayed leadership in Waterloo. This included sticking by Don, not because he necessarily still wanted Don around, but because Don was a member of his team. Just as importantly for the future of Sterling Cooper, Bert chastised Roger for his lack of leadership, and Roger wound up rising to the occasion after Bert’s death. Sally Draper quickly learned to ignore the better looking but cynical older brother after being chastised by her father, and instead displayed interest in the dorkier younger brother who understood what the moon landing meant and had hope for the future. I wonder if Don would have had such influence on Sally before their conversation during the car ride on Valentine’s Day earlier in the season. Unfortunately Betty continued to show what an awful mother she is. Ted went from a low point of wanting to leave advertising and considering going down in the plane to being persuaded by Don to remain in a creative role, as this was required for the deal to work. I saw this exchange as being even more important for the rehabilitation of Don, now showing a leadership role, than for Ted. Even after death, Bert returned for a big musical number, as every season of Mad Men needs one of these. Bert, previously displayed as a follower of Ayn Rand, was last seen contradicting this philosophy in singing, The Best Things In Life Are Free. This better portrayed Don’s viewpoint, as he made the scene work by looking on in disbelief. Don really just wanted the opportunity to create, but it was everyone else’s greed which allowed him to achieve this. Perhaps Bert will return to sing some more advice for Don in the future. I also suspect that the question as to whether Bert’s sister is still alive will have ramifications in the final episodes. I was not thrilled with the development a few years ago of starting over with a new firm, but now this now makes sense in the grand scheme of things. The formation of Sterling Cooper Draper Price and their subsequent development into a firm capable of taking a big account placed Roger, now showing the leadership Bert wanted to see, in a position to negotiate a good deal for all of them. With a new five year contract the second half of the season should no longer be burdened with a weakened Don Draper. Hopefully we will have a truly independent subsidiary of McCann Erickson with Roger leading the business end and Don as the clear Creative Director.